Rev. Talman Wagenmaker was born and raised in western Michigan. He completed a B.S. in Chemical Engineering from Michigan Technological University and worked in engineering within the pharmaceutical industry. Rev. Wagenmaker received further education at Westminster Seminary in California (MA-Theology in 2001) and Mid-America Reformed Seminary (M.Div. 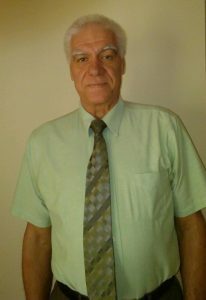 in 2005), after which God called him to the ministry. 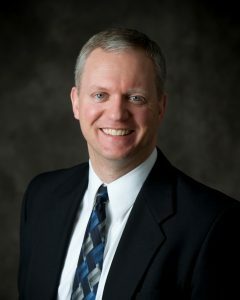 He has served as a deacon in the Covenant URC in Kalamazoo, Michigan and was ordained as a minister in 2006 in the Grace United Reformed Church in Waupun, Wisconsin. He began serving as pastor at the Dutton United Reformed Church in June, 2018. Rev. Wagenmaker desires his ministry to be focused on the gospel of Jesus Christ, in a confessional Reformed context. The gospel is the power of God for salvation to everyone who believes; the Reformed confessions are the purest and most consistent expression and application of the gospel. Pastor Larry Johnson was born and raised in Oak Lawn, Illinois; a suburb of Chicago in 1953. He married Sarah Voortman in 1974. They were blessed with 5 children. He entered Mid -America Reformed Seminary in 1997 and upon graduation accepted a call to Doon United Reformed Church in Doon, IA. In 2009, he accepted a call to serve in a church plant in Prinsburg, Minnesota. In 2012, Pastor and Sarah moved to Jamestown, Michigan so Pastor could begin teaching Bible in Zion Christian School in Byron Center. In September 2016, he was hired to be Pastor of Congregational Visiting in Dutton URC. “Emeritus” is often thought of as “retired” or “old.” Pastor Moes doesn’t like those labels. He was born when his father, the Rev. Herman Moes, was in his first charge in Chicago in 1921. Later his father served in Waupun, WI for six years before moving to Pease, MI. His father was the first pastor in Pease to preach in English – two English and one Dutch every Sunday for 13 years. The son attended almost all of them. He had one younger brother and has five sisters. Pastor John attended the Christian school in Pease during the depression years. When he was about nine, Johanna Veenstra, a missionary from Nigeria, impressed him so vividly that he determined to give his life as a servant to the Lord as a foreign missionary. After finishing high school by correspondence he started the pre-sem course at Calvin College. During his third year, due to a slight physical problem, he took a year off. Meanwhile WWII started and he was drafted. He married his grade-school sweetheart, and a year later their first son was born. When he was discharged he learned photoengraving/printing and worked in a country newspaper for 12 years. He also cut lumber and built his own house. Not being able to ignore the call, he applied for and was hired by Classis to start a church as a layman in Waterloo, IA. The Lord blessed his efforts (seven unchurched families converted) so that it was decided they needed an ordained pastor, and he himself felt confident (even with five children) to complete his last two years of college and three of seminary. In that last year he helped his wife and daughter start what turned out to be the first Kid’s Life Bible Club. After graduation in 1962 he was ordained in North Blendon Christian Reformed Church. His first taste of foreign mission work was there with the Mexican farm workers that met in that church. He served there four years, four more in the Toledo, OH church, and then seven years in Conrad, MT. After that he started another church in Helena, MT., work which was also richly blessed by the Lord. While in Helena he was Chaplin of the Montana House of Representatives for a whole season. He also designed and built the first ever solar heated church building, for which he obtained a government grant. One more ministry he started was the one to Seamen coming in merchant ships to Seattle. He was called by and served under Classis until, after four years, they wanted to change the very fruitful program. When no agreement was reached, they decided to discontinue. But he had turned 65 and so retired. However he and his wife continued the same work for another 16 years without pay. They were “Mom and Dad” to at least 10,000 men from 65 different countries – 20 years as “foreign missionary” – 70 years after the Lord put it on his heart. In 2001, two years after she suffered a stroke, he entrusted his beloved wife and constant companion to the Lord. He climbed his last gangway in 2003 and moved the Grand Rapids. 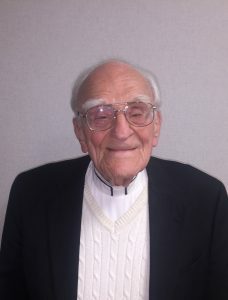 He is still teaching Kid’s Life Bible Club at Dutton Public School during the school year, conducting worship services at rest homes, serving on the evangelism committee and serving communion to shut-ins. He is Pastor Emeritus but he thinks that sooner or later he might be old and retired.